In 1181 Lord Hugh de Lacy built the first castle here to defend the strategic crossing of the River Barrow after taking the surrounding lands from Irish clans. In 1320 the First "Black Castle" was built. There are no visible remains of either of these two castles. The ruin on the site today is reported to have been built by Sir Edward Bellingham, Lord Deputy of Ireland, in 1547. The south western corner of the castle has collapsed. In the adjoining garden lay fragments of a bawn wall with arrow slits at the corner. The castle was held by the Kavanaghs and the Butlers and was also occupied by Sir Peter Carew and the Bagenals. For 150 years, the Kavanaghs charged English lords “black rent” for safe passage over the river. The castle was destroyed by Cromwellian forces, under Colonel Hewson, in 1650 during the Irish Confederate Wars. Sadly our enjoyment of this site was spoilt by the presence of some eastern european fishermen who confronted Deb to let her know they did not want to have their picture taken. Situated: Very easy. 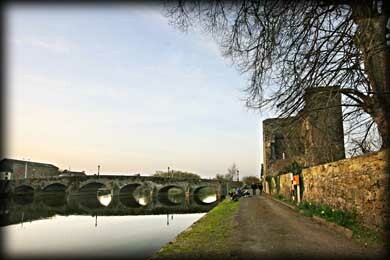 Located on the south eastern side of the Valerian bridge that crosses the Barrow river. Discovery Map 61: S 691 654. Last visit March 2011.